Calcium ions (Ca2+) impact nearly every aspect of cellular life. This review examines the principles of Ca2+ signaling, from changes in protein conformations driven by Ca2+ to the mechanisms that control Ca2+ levels in the cytoplasm and organelles. Also discussed is the highly localized nature of Ca2+-mediated signal transduction and its specific roles in excitability, exocytosis, motility, apoptosis, and transcription. 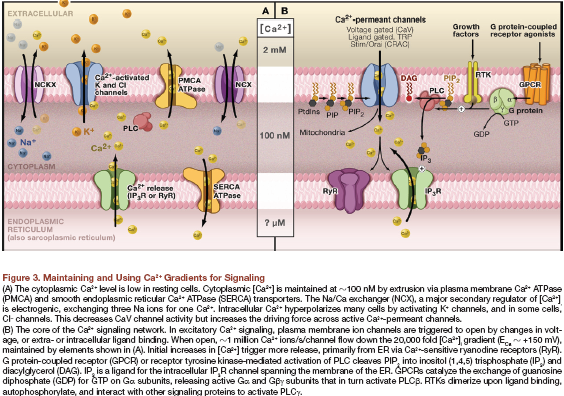 to Ca 2+ binding proteins, Ca 2+ entry across the plasma membrane, and the localized nature of Ca2+ signals.